Earlier today, we took a look at the world of comic art reps and how their businesses impact the lives of comic artists. It was a deep dive into the subject, but one that didn’t really look at the art itself. It’s understandable for the piece, but it’s why I wanted to put together a piece on the art that is generated by those dealings between reps, artists and comic fans. In short, I thought it was a good opportunity to share some of the treasured pieces I have in my art collection. 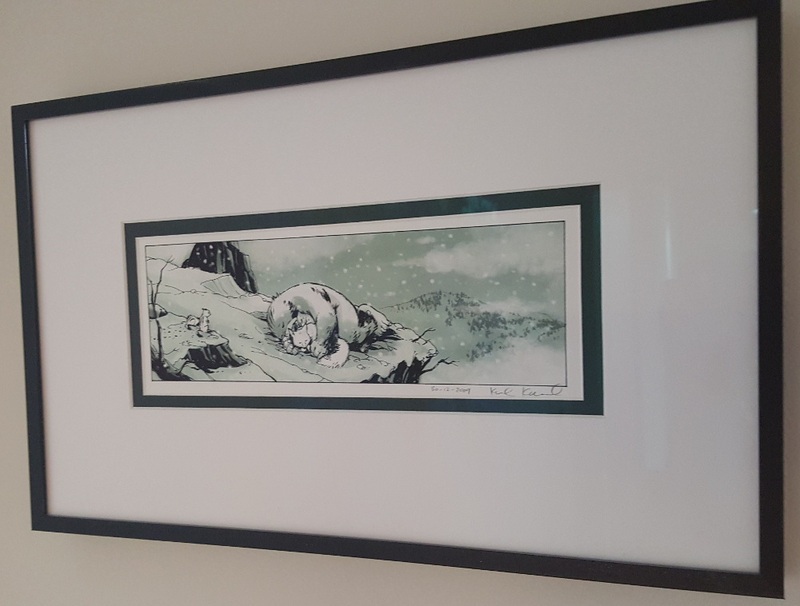 While what you see is strictly from my original or commissioned art collection, I also have several prints that I cherish, including a strip from Karl Kerschl’s The Abominable Charles Christopher, covers and interior art prints from Kazu Kibuishi’s stellar Flight anthologies, and an array of other pieces that are proudly displayed in my home. While I have made deals for other pieces not shown here, the biggest reason for that is that I often buy commissions for friends and family as Christmas and birthday presents. I find that they make great presents. In particular, I’ve worked with cartoonist Natalie Nourigat (creator of the just announced Over the Surface, congrats Tally!) to have pieces created for family members, my wife, and even on occasion myself, and they have universally went over well. To me, original art is a very special part of comics. More than anything, I’m blown away by the ability artists have to create something out of nothing. Sure, writers do the same thing with words, but artists can bring the things they have in their head to life in a way I never can, and it’s a skill that I’m always envious of and impressed by. These pieces below are a look at what I have in my collection along with a story that goes with them, and please, if you have special pieces to your name, please share them in the comments. I’d love to see what you have in your collection. Especially if it’s a themed sketch book, as that is the thing I most want to start but never have. Alas. A quick note: most of these pieces are in frames of some variety, so awkward angles were necessary to not get a terrible glare. Artists, my apologies for the awkward angles, but I think you can still tell how awesome each piece is. * Please do not start begging Rob to put you in his comic on your video shows. Our tricks are difficult to repeat, as is our level of dedication and willingness to debase ourselves. 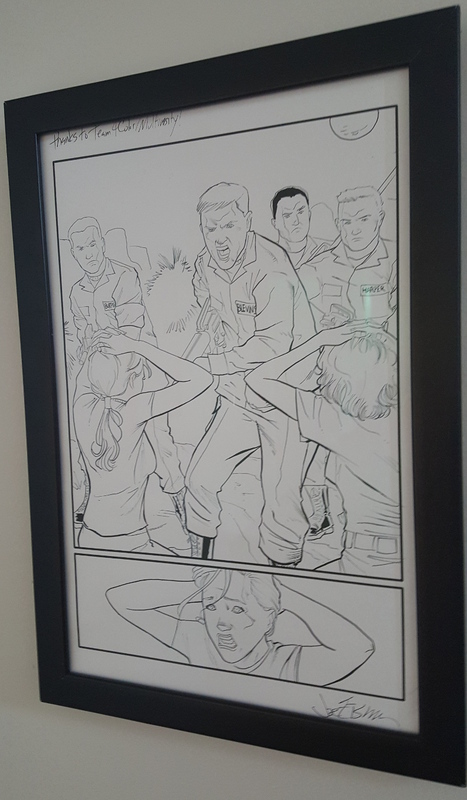 The other piece of original art I own, and this one also features Brandon and I in the piece (I’m the soldier on the right, Brandon’s the one on the left). Joe Eisma’s a great artist and a cool guy, and to have him work us into a comic like Morning Glories was a gigantic thrill. This also came from being good for nothing beggars, but once again, that is hardly a recipe for success. Also, I swear I’m not the most vain comic fan ever. 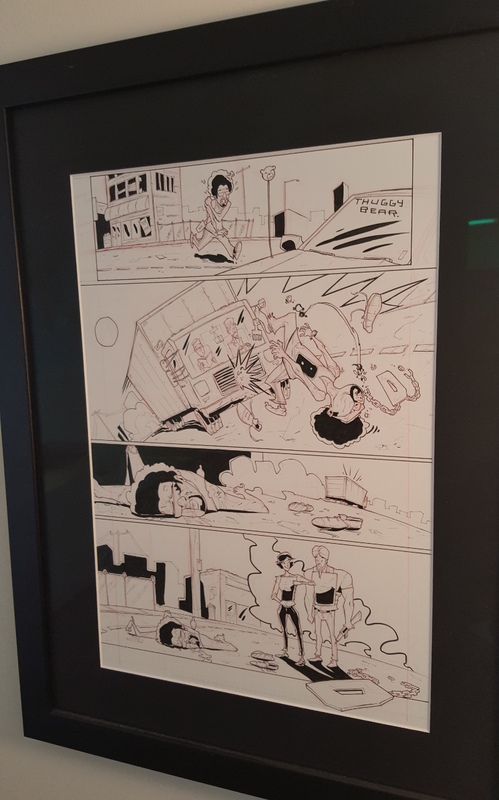 It’s just cool to be able to buy a page from a comic you’re in! This commission is one I picked up at NYCC 2013, and it features one of my all-time favorite characters drawn by one of my favorite artists. When I signed up for a commission from Declan, I genuinely didn’t know what I wanted, so I gave him a list of characters. We eventually settled on Heath Huston, the lead from Fear Agent, and looking at it now, it’s stunning how perfect of a fit for that book he would have been really. This is one of my two favorites piece from my collection. It’s for a number of reasons. 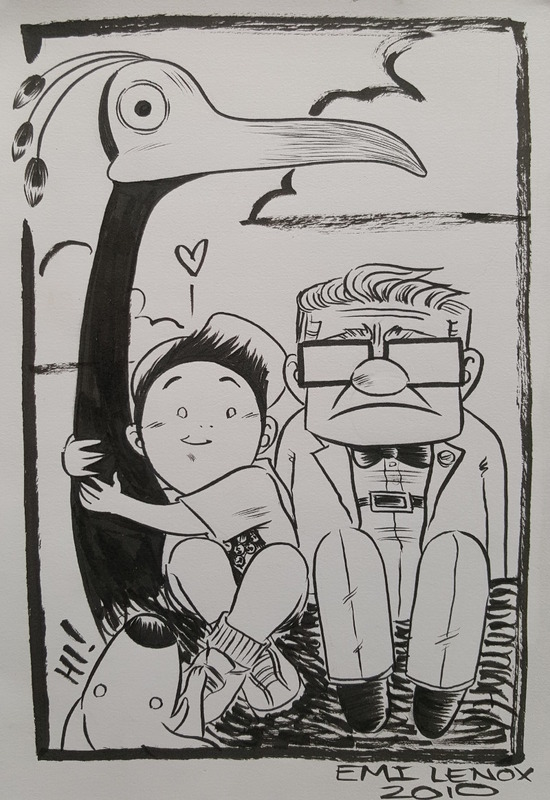 Back when I was at Multiversity, we put together a charity art month to benefit Bill Mantlo. It was called Guardians Month. It was one of my favorite projects in my time at Multiversity. Christian’s piece was my favorite of all of the pieces created for it, and ultimately, I was outbid in the auction to get it. Thankfully, I was outbid by my parents, who had bought it for me for my birthday/Christmas present. It will always remind me of that auction and helping Mantlo in any way we could, and it’s just a freaking beautiful piece. Christian Ward, right? Dude’s a god. 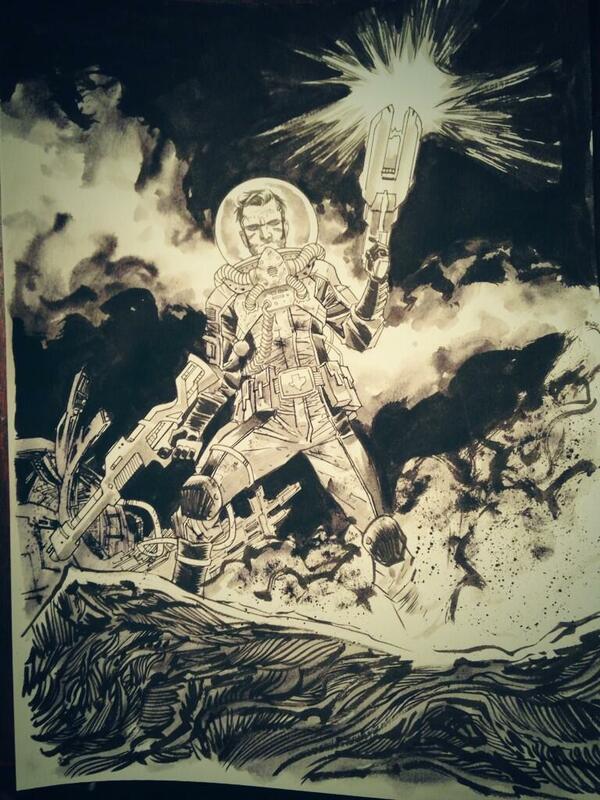 It also ended up becoming the cover to Guardians of the Galaxy #23, which is neat as well! This is my other favorite piece, and as you can see, it has a note beneath it. Y the Last Man is both one of my favorite comics ever and one of three comics – Y, Fables and The Walking Dead – that got me back into comics after a multi-year hiatus. It was the first one I picked up in 2003 to inspire my full-time return. Eventually, I actually wrote Guerra a letter sharing my story about leaving comics and how her and Brian K. Vaughan’s work reignited my love for the medium. A while later, I received a board with a sketch of Yorick and Ampersand on it, along with a small letter from Guerra sharing her thanks for the story. At least in my brain, it made sense to pair the letter with the art, as both pieces together made the memory which is what really made it special. It was a really nice thing to do, and it made me an even bigger fan of a great artist. I’m a big Parks and Rec fan. Nourigat was as well. 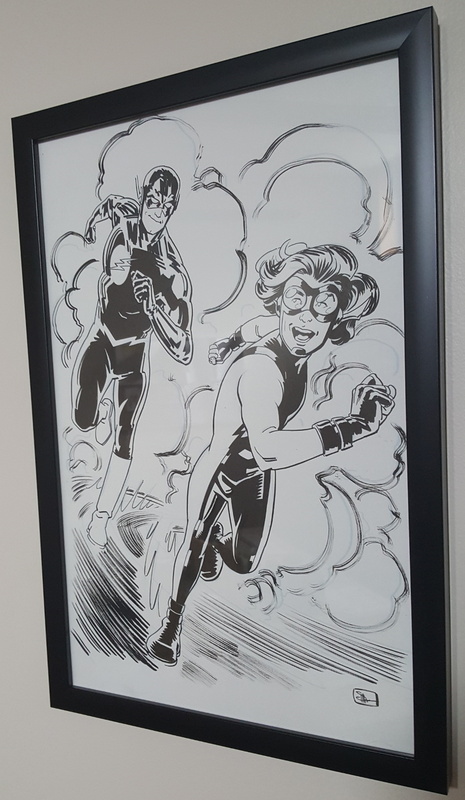 She’s also a really, really nice person, and knowing that I was a fan, for two straight years at Emerald City ComiCon she put together fan art of two of my favorite moments from the first three seasons of the show and gave it to me. 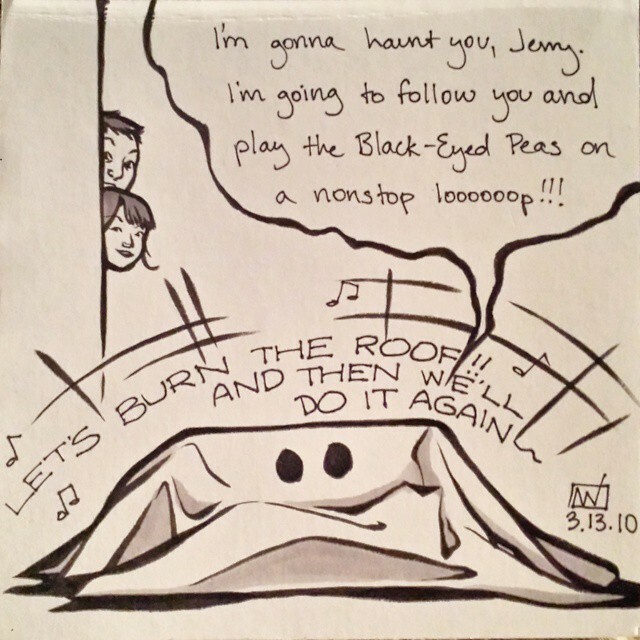 It was a very nice thing to do, and it has always made me love that Ghost of DJ Roomba scene (pictured above) and Ron Swanson in a kimono, corn rows and a post Tammy 2 haze (not pictured) even more than I originally did. And I loved those scenes A LOT to begin with. Also, as a comic encapsulation of a complete scene, that picture just rules, doesn’t it? Emi Lenox is another artist I’ve been a fan of for a while, as her webcomic Emitown was always a favorite, and I’m really excited to see her work on her upcoming graphic novel Tadaima and her collaboration with Jeff Lemire and Jordie Bellaire. She has a great style, and she once opened up a quick commission list that I jumped on. As a massive fan of animation – and a major fan of the movie Up! which had come out the year before I signed up for this commission – I was really curious as to what she would come up with when I asked for an Up! piece. As per usual, she did not disappoint. Doc Shaner’s been a personal favorite for the past few years, and when I saw he was going to be at Emerald City ComiCon 2014, I managed to get on his commission list. I knew before I even asked what I wanted this time. For some reason, he always felt like a great fit for The Flash and Impulse – two of my favorite superhero characters – and the resulting commission was a thing of beauty. That’s up in my office at work, along with a lot of the other pieces shown here. 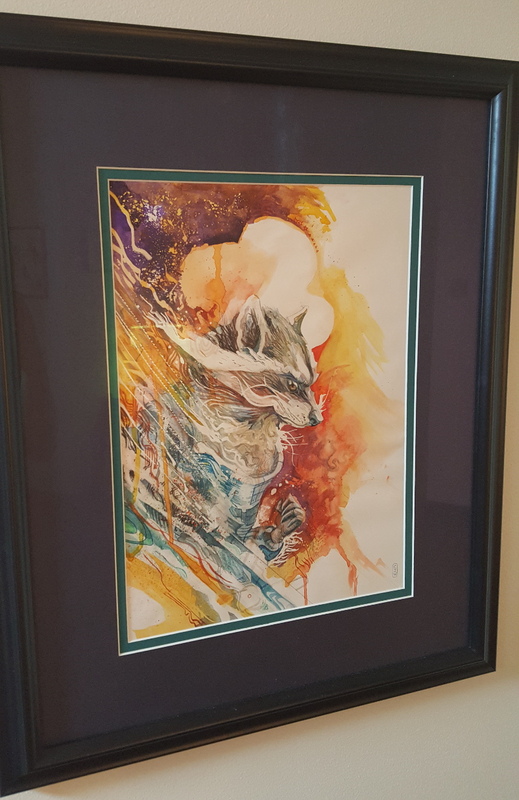 Signing up for a commission by either of these immensely gifted artists seemed like a great idea, but at Emerald City ComiCon a couple years back, they had a rare treat: they were doing pieces together, with Hurtt penciling and Kindt finishing with watercolors. Not only that, but they had a deal for packs of four 5×7 pieces. 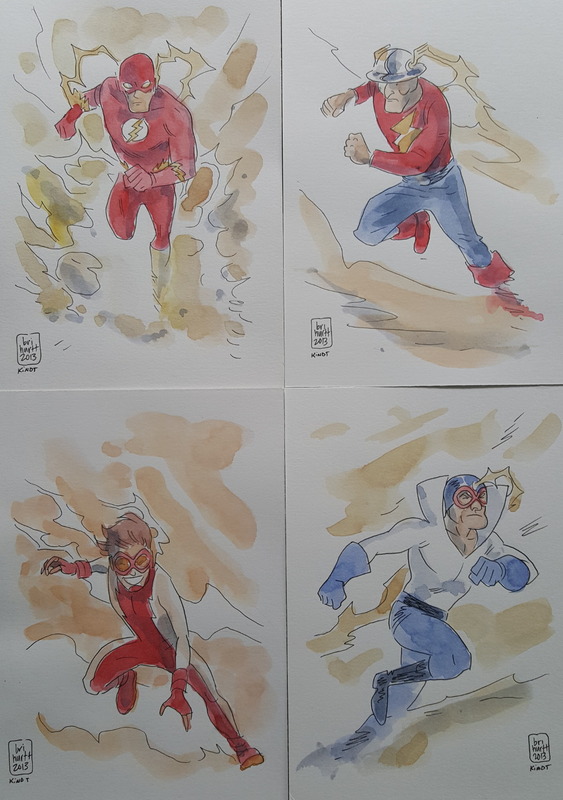 As a major Flash fan – like I said before – the idea of getting a set of four of my two favorite characters with their mentors was an idea I couldn’t resist, and the pair of artists did not disappoint. The best part was I wasn’t even at the con, and former Multiversity EIC Matthew Meylikhov picked them up for me. Thanks to all involved, as I treasure them! This is one of those pieces where I signed up for the commission from the artist before I knew what I wanted. 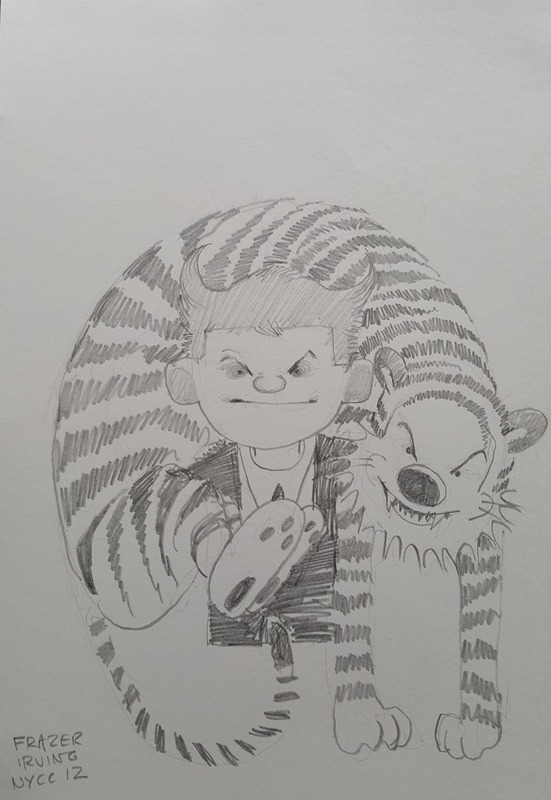 But as a gigantic fan of Calvin and Hobbes and knowing Irving is really, really good at making anything creepy, there was something intoxicating about getting Irving to tackle that favorite from my childhood. I’m glad I did, as his unique take was creepy as hell, unexpected and in a weird way, just what I was looking for. Contradictory, I know, but I think it’s a fantastic piece. Besides being a top notch letterer, Dustin Harbin’s a really phenomenal artist as well with a very unique style. He’s had an ongoing project called Persons of Interest where he’ll draw a person/character once and only once. That type of thing is of great interest to me, and the fact it was Harbin doing the art made it irresistible. 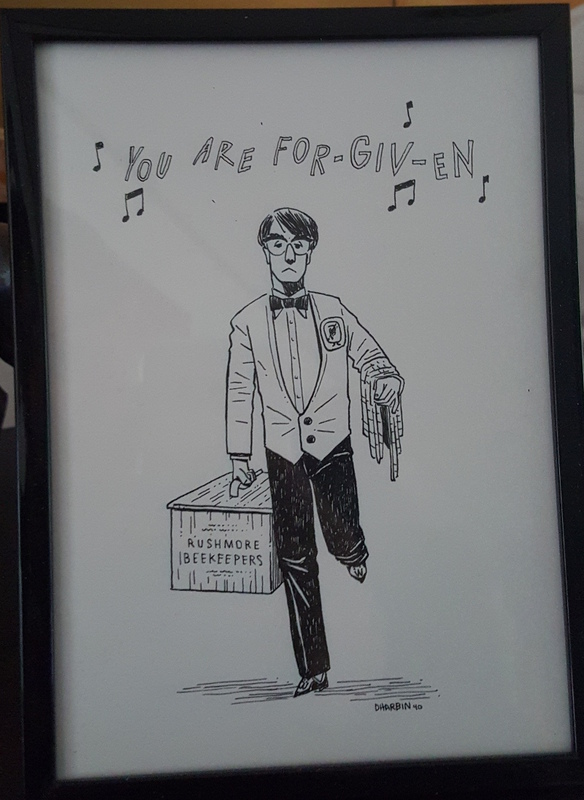 Rushmore’s my favorite movie, so getting a Max Fischer piece was a shoo-in, but getting back an image that called back to my favorite moment in the movie and my favorite song from the soundtrack took it to the next level. I keep this one at my desk at home where I work. Have a commission or piece of original art you’d like to share? Do so in the comments! I’d love to see what you have!